For information on how to reference ASPECT, please see Referencing ASPECT. Below we list all publications we know about. If you think there is anything incorrect or missing, please leave a comment in this github issue . Nature Communications, vol. 10, pp. 1309, 2019. Geophysical Journal International, vol. 217(1), pp. 650-667, Oxford University Press, 2019. PhD thesis, University of Oregon, 2019. Nature Geoscience, vol. 12(1), pp. 61, Nature Publishing Group, 2019. Proceedings of the National Academy of Sciences, vol. 115(17), pp. 4351-4356, National Acad Sciences, 2018. PhD thesis, Portland State University, 2018. Geochemistry, Geophysics, Geosystems, vol. 19(9), pp. 3596-3604, 2018. Solid Earth, vol. 9(2), pp. 267, Copernicus GmbH, 2018. Geology, Geological Society of America, 2018. Geophysical Journal International, vol. 216(2), pp. 794-802, Oxford University Press, 2018. Physics of the Earth and Planetary Interiors, vol. 276, pp. 10-35, Elsevier, 2018. Abstract: We describe the implementation of a second-order accurate volume-of-fluid interface tracking algorithm in the open source finite element code ASPECT, which is designed to model convection in the Earth's mantle. This involves the solution of the incompressible Stokes equations coupled to an advection diffusion equation for the temperature, a Boussinesq approximation that governs the dependence of the density on the temperature, and an advection equation for a marker indicating the two initial density states. 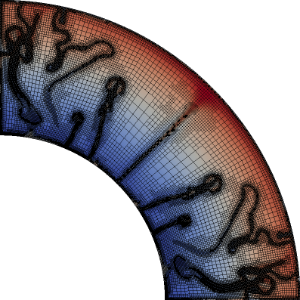 The volume-of-fluid method is fully parallelized and is integrated with the adaptive mesh refinement algorithm in ASPECT. We present the results of several standard interface tracking benchmarks in order to demonstrate the accuracy of the method as well as the results of several benchmarks commonly used in the computational mantle convection community. Finally, we present the results of computations with and without adaptive mesh refinement of a model problem involving thermochemical convection in a computationally stratified fluid designed to provide insight into how thermal plumes, that eventually reach the Earth's surface as ocean island basalts, originate at structures on the core-mantle boundary known as Large Low Shear wave Velocity Provinces. PhD thesis, Utrecht University, 2018. Tectonophysics, vol. 723, pp. 1-13, 2018. Science Advances, vol. 3(7), pp. e1700457, 2017. New: Choice between different formulations for the governing equations including Boussinesq and anelastic liquid approximation. New: Melt transport (two-phase flow). Particles: new generators, ghost exchange, performance improvements, interpolation to fields. New: Nondimensional material model for incompressible (using the Boussinesq approximation) and compressible computations (with ALA or TALA) for nondimensionalized problems. This can be used for benchmark problems like Blankenbach, King, etc..
New: Optional DG method for temperature/composition. New cookbooks: continental extension, finite strain. New benchmarks: TanGurnis, Blankenbach, King. Many other fixes and small improvements. PhD thesis, Universität Potsdam, 2017. PhD thesis, University of Leicester, 2017. Physics of the Earth and Planetary Interiors, 2017. Geophysical Journal International, vol. 210(2), pp. 833-851, 2017. Nature Geoscience, vol. 10(10), pp. 793, Nature Publishing Group, 2017. Physics of the Earth and Planetary Interiors, Elsevier, 2017. Physics of the Earth and Planetary Interiors, vol. 273, pp. 1-10, Elsevier, 2017. Abstract: Mass redistribution in the convecting mantle of a planet causes perturbations in its moment of inertia tensor. Conservation of angular momentum dictates that these perturbations change the direction of the rotation vector of the planet, a process known as true polar wander (TPW). Although the existence of TPW on Earth is firmly established, its rate and magnitude over geologic time scales remain controversial. Here we present scaling analyses and numerical simulations of TPW due to mantle convection over a range of parameter space relevant to planetary interiors. For simple rotating convection, we identify a set of dimensionless parameters that fully characterize true polar wander. We use these parameters to define timescales for the growth of moment of inertia perturbations due to convection and for their relaxation due to true polar wander. These timescales, as well as the relative sizes of convective anomalies, control the rate and magnitude of TPW. This analysis also clarifies the nature of so called “inertial interchange” TPW events, and relates them to a broader class of events that enable large and often rapid TPW. We expect these events to have been more frequent in Earth's past. Physics of the Earth and Planetary Interiors, vol. 262, pp. 90-100, 2017. Search.Proquest.Com, vol. 8(July), pp. 1-19, Copernicus GmbH, 2017. PhD thesis, Utrecht University, 2016. PhD thesis, Potsdam University, 2016. Geophysical Journal International, vol. 207(3), pp. 1343-1366, 2016. Geochemistry, Geophysics, Geosystems, vol. 17(4), pp. 1454-1479, 2016. PhD thesis, University of California, Berkeley, 2016. Geology, vol. 43(10), pp. 927-930, 2015. Geochemistry, Geophysics, Geosystems, vol. 16(7), pp. 2175-2196, 2015. PhD thesis, Utrecht University, 2015. PhD thesis, Utrecht University, 2014. Geophysical Journal International, vol. 191, pp. 12-29, 2012. Created by JabRef on 20/04/2019.